A bench for visitors to rest upon while they enjoy the many surrounding wildflowers in the village of Moustiers Ste Marie in Provence, France. In today's busy world, to find a bench just waiting for visitors to rest where time stands stills while one enjoys the surrounding beauty of the wildflowers, is an opportunity which should not be missed. The people who enjoy their own gardens are very lucky, but wherever one goes there are always wildflowers that can pop up in the oddest places. 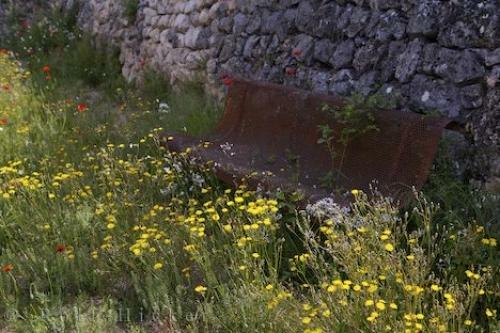 Photo of a bench surrounded by wildflowers near the village of Moustiers Ste Marie in Provence, France where visitors can rest. To sit on a park bench and watch nature takes its course during the summer months in the village of Moustiers Ste Marie, is time well spent. Even along the Cote d'Azur, by the Mediterranean Sea, there are wildflowers that flourish in the sea air, such as the Scotch thistles growing in the red rock of the Corniche de l'Esterel. The climate of Provence, France is kind to all flowers whether they be cultivated or wild, but the best thing about the wildflowers is they can be enjoyed for free. Many visitors to this village, have stopped at this park bench to rest while admiring the beauty within arms' reach. A park bench surrounded by wildflowers and poppies amongst terraces of Olive trees in the village of Moustiers Ste Marie, Alpes de Haute, Provence, France, Europe. I photographed this photo with the digital SLR camera model Canon EOS-1Ds Mark II, aperture of f/7.1, exposure time of 1/80 sec. on ISO 100, as always I used a original Canon Lens, the focus lenght for this picture was 43mm.